While visiting mainland China some years back, playwright David Henry Hwang was invited to see a new arts center in a large provincial city. He was very impressed with the state-of-the-art facility; he was also thoroughly taken aback by the embarassing mistranslations between English and Chinese that populated the signs at this otherwise immaculately turned out center. In Chinglish, Hwang explores the deeper problems that these mistranslations point towards, while also exploiting the hilarious misunderstandings they engender for maximum comic effect. American businessman Daniel Cavanaugh (Gary Wilmes) – owner of a sign-making business – knowing nothing about either the culture of China or its language, seeks a relationship with government officials, hoping to expand his market. Along the way, he becomes involved in an intrigue with the guarded, mysterious Xi Yan (Jennifer Lim). Lim and Wilmes play out the complicated relationship between Daniel and Xi with great attention to detail, not letting a stitch drop when it comes to the social and moral implications of what goes on between them. Leigh Silverman’s taut direction helps a lot, too, filling out the third dimension in Hwang’s occasionally over-schematic script. Chinglish is also an impressively designed show: Anita Yavich’s costumes make droll points about the fetishization of Chinese culture by Westerners and vice versa. David Korins’ double-turntable set is a marvel, especially when moving in sync with sound designer Darron L. West’s pungent musical selections. 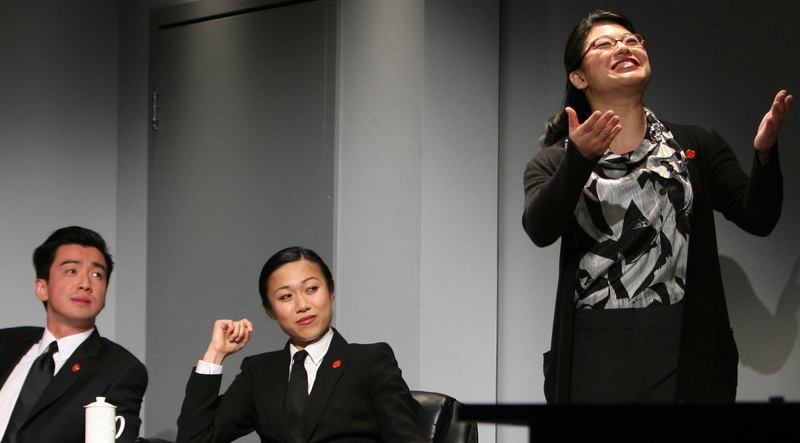 The surtitle projections by Jeff Sugg and Shawn Duan – an essential part of a show where a large percentage of dialogue is in Chinese – are mercifully clear, but the need to focus on them for long periods of time can be a bit headache inducing. Chinglish is intelligent and insightful, but wears its smarts lightly. All in all, a brisk, engaging comedy with some serious issues on its mind.